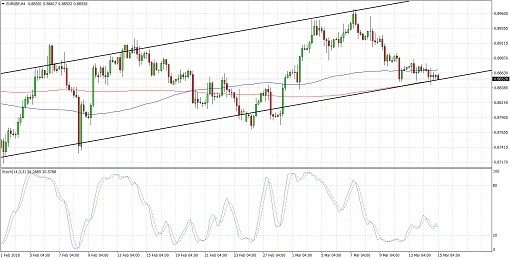 EURGBP is trending higher on its 4-hour time frame, moving inside an ascending channel and currently testing support. A bounce could take it back up to the resistance at the .9000 major psychological level. Stochastic is already moving up from the oversold region to signal a return in bullish momentum. The 100 SMA is above the longer-term 200 SMA to confirm that the path of least resistance is to the upside. In other words, support is more likely to hold than to break. The 200 SMA also lines up with the bottom of the channel to add to its strength as a floor. The euro was dragged lower by another round of cautious remarks from ECB head Draghi, who reminded that inflationary pressures are still weak and that policymakers haven’t discussed their next moves just yet. ECB member Praet also said that they cannot declare “mission accomplished” yet when it comes to inflation. There have been no major reports out of the UK but sterling has been one of the better performers, likely on account of upbeat data and fading Brexit concerns. There are still no reports lined up from the UK economy today. As for the euro, only the final CPI readings are due until the end of the week, so disappointing reports could have an even stronger drag on the shared currency. Upgrades, on the other hand, could still keep ECB tightening expectations in play.